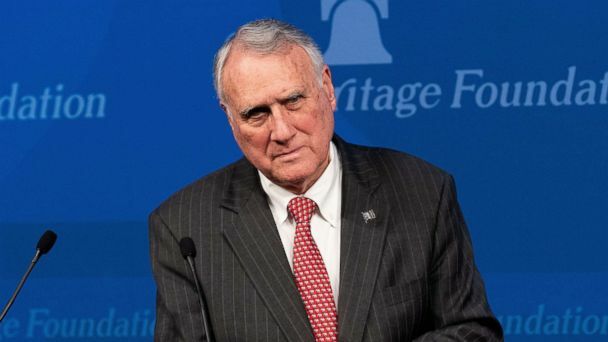 Sen. Jon Kyl, the Arizona Republican appointed following the passing of longtime Sen. John McCain earlier this year, will step down at the end of the month, the state's governor announced Friday. "When Jon Kyl returned to the Senate in September, our country faced many critical issues. Arizona needed someone who could hit the ground running from day one and represent our state with experience and confidence - and that's exactly what Senator Kyl has done," Arizona Gov. Doug Ducey wrote in a statement released Friday, "Over the last few months, Senator Kyl served with the same integrity and statesmanship that marked his 26 years in Congress." Kyl, who previously served in the U.S. Senate for 18 years and became a high-ranking member of the GOP caucus, delivered the news to Ducey in a letter dated Dec. 12. "When I accepted your appointment, I agreed to complete the work of the 116th Congress and then reevaluate continuing to serve. I have concluded that it would be best if I resign so that your new appointee can begin the new term with all other Senators in January 2019 and can serve a full two (potentially four) years," Kyl wrote in his letter to Ducey. Under Arizona state law, Ducey now has the power to appoint a replacement that will serve until the next general election in Arizona, which will take place in 2020. The news of Kyl's resignation immediately fuels speculation over who Ducey will appoint to the seat next. One name that has been the subject of intense speculation is GOP Congresswoman Martha McSally, who narrowly lost her bid for the Senate last month to Democratic Rep. Kyrsten Sinema. McSally, a former fighter pilot in the United States Air Force, was first elected to Congress in 2014, winning the race for Arizona's 2nd Congressional District, a traditionally Democratic district along Arizona's southern border. McSally defeated her two main rivals, former Maricopa County Sheriff Joe Arpaio and state Sen. Kelli Ward, in the 2018 Republican U.S. Senate primary to succeed retiring U.S. Sen. Jeff Flake, receiving 52.9 percent of the vote. Richard Herrera, a political science professor at Arizona State University, told ABC News last month that the close nature of the recent Senate race could help make McSally a front-runner. "I think it's very plausible," Herrera said. "I would think she's the favorite," he added, noting that the close nature of the Senate race and McSally's support for President Donald Trump could be helpful advantages for her. "She checks a lot of boxes," Herrera said. However, there is a growing sentiment among some Republicans in Arizona that McSally had her shot at a seat, and that Ducey should look for a replacement elsewhere. "There is momentum building for an "Anybody But McSally" appointment among the Arizona donor community," Dan Eberhart, an Arizona-based GOP donor told ABC News. "Arizona Republicans have a deep bench of qualified, electable candidates. She should be strongly considered, but Ducey's duty is the pick the best Arizonan." Neither Ducey's office nor McSally's campaign returned ABC News' requests for comment on her potential appointment to the U.S. Senate. Other potential replacements include Kirk Adams, Ducey's chief of staff, former GOP U.S. Reps. Matt Salmon and John Shadegg, Maj. Gen. Michael McGuire and Arizona State Treasurer Eileen Klein. In announcing the news of the Kyl's resignation, Ducey also praised Kyl's longtime service to the state of Arizona which also included eight years in the U.S. House. "Senator Kyl didn't need to return to the Senate. His legacy as one of Arizona's most influential and important political figures was already without question. But he did return, and I remain deeply grateful for his willingness to step up and serve again when Arizona needed him. I wish him and his family all the best," Ducey wrote. ABC News' Meghan Keneally and Rick Klein contributed to this story.